How to read a compass? Home Destinations Techniques Camp How to read a compass? This simple device that fits in the palm dela hand and has so few elements you can count on the fingers, has bailed out more than one confused hiker. "With the compass in your pocket, a chief of the Scouts left the camp to fetch supplies. As the road was" clearly "did not take any map. Coming back, when he went back into the woods after crossing a meadow the trail is vaguely distinguished My friend strayed a bit in the wrong direction only a little;... after walking half a day, nothing looked familiar Resisting sinking feeling, rose to a high point and examined the ground up he recognized a lot of rocks in which it had set near the camp. a direction taken with the compass toward the rocks, gave him a straight line to go there. at home again, with provisions! " First, and for greater accuracy, remember these rules: - Put yourself in front of the object whose direction you are taking. 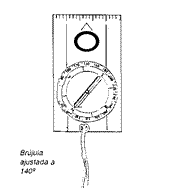 - Keep the compass level (should be parallel to the ground, if any). maintaining the well, the needle will move freely. - Hold the compass directly in front of you, not at an angle. - To align the magnetic needle and orienting arrow, hold the compass close enough so that you see the field looking down, not a glancing blow. So you will be able to place the needle directly over the orienting arrow with its ends aligned. Do you remember, when you studied in high school geometry, a circle is divided into 360? Well, the area of the compass is simply a circle divided into degrees, numbered from O to 360. Measured in the direction of movement clockwise from top (0 degrees or north), in the -.90 ° first quarter circle, East, there is a 90 ° angle. South, located exactly .- a half circle from the north, is located at 180 degrees. The West is 270 degrees. A second set of marks divide the field compass quarter, pointing the cardinal points: N, E, S and O (north, east, south and west addresses the compass). The following basic skill with the compass is used to measure a bearing (direction) to a recognizable point on the ground, you're watching. This is done simply by reversing the steps.